Melanie Rosalind C. Talimio - Syntactics Inc.
Having graduated with a degree in Accounting, Melanie has been an experienced accounting practitioner for years. Melanie is a licensed CPA and has previously been an external auditor, a tax practitioner and an accountant. Melanie and her husband Raymundo Talimio Jr. also run their own accounting firm Talimio, Caragos-Talimio & Associates, CPAs. At Syntactics, Inc. she holds the position of being the Chief Finance Officer or CFO and the company Treasurer. 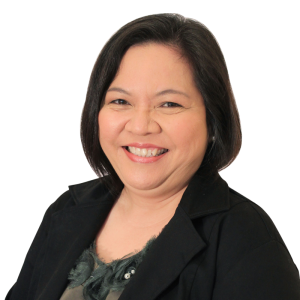 Additionally, as a leader, Melanie is actively involved in the Philippine Institute of Certified Public Accountants especially during her term as president in the years 2007-2008. Wilfredo P. Kaamiño Jr.Raymundo G. Talimio Jr.